Jason Brown, the coaching star of "Last Chance U," wants to make one thing clear. He should never have referenced Hitler in an angry WhatsApp message to a German player/manager on his Independence Community College football team. Even by his often purposefully abrasive forms of communication and motivation, that was wrong. "I'm sorry," Brown told Yahoo Sports in his first public comments since he resigned last month from the ICC job due to the comment becoming public. "I apologize. I never should have typed that into a message." Brown says he was trying to get the attention of Alexandros Alexiou, a player in his program who Brown says doubled as a manager. Like many of the young men who play junior college football, Brown said Alexiou was in and out of trouble. At the time, Brown said he was dealing with repeated disciplinary issues and a face-to-face meeting never materialized. As such, Brown kept ramping up his messages. "4:10 on the field u German [expletive]," Brown wrote as part of one message, suggesting some physical discipline. "... I'm your new Hitler figure out your life," he wrote later. When Alexiou questioned why he was in trouble, Brown said he was done. "You are now cut from the team, go yell somewhere else," Brown wrote minutes later. "... you won't be a part of this program disturbing dorms and classes and teachers and basketball coaches and every other thing. Good luck Alex." The exchange was eventually published in the local Montgomery County Chronicle. Alexiou told KGGF radio that he came to America and ICC to play football and that he "thought the Coach Brown [he] saw on 'Last Chance U' was just an act but quickly found out that wasn't the case." He said Brown's comments were inappropriate and filed a complaint of discrimination with the school. "I don't think it's right," Alexiou told the Chronicle. "I know I did some stupid things to get a suspension, but there are a lot of other incidents on the team that do not get reported." The school launched an investigation. Brown surveyed the situation and decided to resign as ICC's coach after three seasons that, thanks to Netflix, had become high-profile. Brown claims there is more to the story, namely that the player often referred to himself as Hitler and was reading Hitler's autobiography at the time, but he knows none of that really matters. Neither does whatever prior problems existed, campus politics or any jealousy over publicity that might have factored into everything. Using Hitler as a nickname is never OK, particularly by an authority figure. That includes the rather rough-around-the-edges world of junior college football. "I'm as juco as juco gets," Brown said. That's part of what made Brown a television star before, eventually, causing him to lose his job and seek a reboot to his career. Brown's background is unique. Raised in inner-city Los Angeles, he admits to making plenty of mistakes as a young man before turning his life around and eventually getting into coaching. At both the high school and junior college levels he specialized in winning games and connecting with hard-to-reach young men like he used to be. Part of that was increasingly heating up his language to get the attention of kids who come almost exclusively from single-parent homes. "The single mothers of these kids yell a whole lot worse things I do," Brown said. 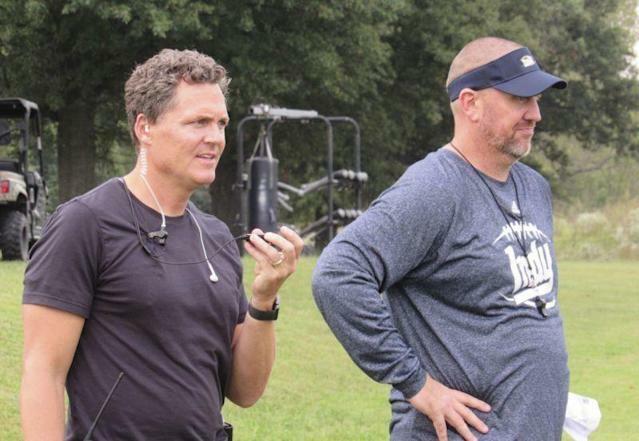 After "Last Chance U" spent the first two seasons (2016, 2017) of its popular show at East Mississippi Community College, it went looking for a change of pace. Enter Brown and Independence, where the dialogue, conflict and chaos all seemed amplified. The end-of-the-line ethos felt even more pronounced at Independence — unlike East Mississippi coach Buddy Stephens, a native Southerner, Brown was as much a fish out of water in rural Kansas as his players. Brown said he's never seen an episode of "Last Chance U," neither before he was on or since (season 4, which features Brown and will cover his departure extensively, will air in July.) He'd rather not know. He didn't even realize how popular the show was until Season 3 began to air and they had to take his email address off the school website. "I had 30,000 emails," Brown said. As crazy as he would act, his bombast, unapologetic outrageousness and colorful personality made him very popular. "I can count on one hand how many were negative and even then, two of them wrote back after Episode 5 to say they now understood me," Brown said. Brown's style was good television. It was also effective with many of his players. The show is called "Last Chance U" for a reason — nearly everyone there is on their final opportunity to make it, either in football, in college, or both. Previous attempts to impact the players have largely failed. "You either graduate and get out of here on a scholarship or you don't," Brown said. "There is no gray area in junior college football. You are doing anything you can to reach them. The ones that wanted that, that did what they needed to do, that went on to have success, they never say a bad word about you. They praise you. Those guys always have my back. You can see on social media. "It's the ones who didn't work, who got kicked out for smoking weed or failing class, those are the ones that bash you," Brown said. Which is why he doesn't apologize for the general way he ran the program. Yes, he said, he's aggressive and volatile and confrontational and profane. But, he notes, players know what they are getting when they sign with his program. He points to the high grade-point average and graduation rates his teams produce, the product of a system that demands things like players sitting in the front row of classes, wearing no headphones and participating in discussion. "I couldn't coach this way in high school," Brown said. "I didn't when I coached high school [in California]. This isn't a classroom or an office setting. This is junior college football. "Again, I regret the text and that's why I apologized, but I sent 220 kids to Division I scholarships and 22 into the NFL," Brown said. "This is about molding boys that don't have any more options. I possess everything I need to be a head coach and to help these boys." Can a coach still behave this way in modern society — a sort of tough-love, 21st century Father Flanagan? Probably. If not for invoking the name of Hitler, Brown is likely still coaching in Kansas after all. Brown certainly hopes he can continue. He's only 43 and would like to coach again — he'll take this year off and figure out his options. That WhatsApp message won't be easily dismissed, but he still believes he's good at reaching the nearly unreachable, all while winning football games. "The definition of a coach is getting you to a place you can't get yourself," Brown said. Brown did that for plenty of players and he did it in his own wild way. That was enough to attract a reality show and a lot of fame. Now he, and everyone else, will get to see how it all comes crashing down with one very bad text message. "I won't be watching," he said with a laugh.